Well we made it to the end of another year, and what a year it was! If you’d had a magic ball this time last year and told me what I’d be able to achieve in 12 months I’d never have believed you. So it makes this the perfect time to give thanks for all the love, support, encouragement, partnerships, inspiration and guidance that I’ve received throughout the year. I’m not going to list everyone who touched my life so positively, because there are too many – you know who you are – plus I don’t want to upset anyone this year by forgetting to give them a mention. But the thing is, we can never achieve as much on our own as we can with others. I really believe it’s one of those fundamental laws of being human that we need to learn that helps us grow together and evolve in consciousness. 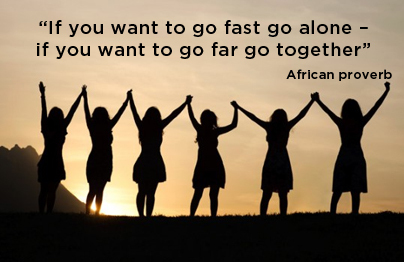 It reminds me of the African proverb, “If you want to go fast go alone, if you want to go far go together.” When you trust that there’s more than enough to go around and you choose to collaborate to work out how everyone can benefit from working together, then magic happens and everyone involved grows and moves forward. I feel really fortunate to have been part of a number of collaborations this year, and Global Winning Women, the organisation that supports purpose-led women in business for whom I’m an Ambassador in central London, has been perhaps the most transformational one for me. I only launched my London group late in 2013 so I started this year with lots of nerves, but with a huge conviction to support the members and make it a success. As I often mention, public speaking and being in the spotlight has been a big challenge all my life, and on the day of each meeting I would get through plenty of Rescue Remedy before I had to stand at the front of the room and host. I would spend ages preparing what I wanted to say, hoping that I’d remember it, but mostly hoping that the women would get exactly what they needed from coming out and investing their time and money. When each of them walked through the door I wanted them to feel they were amongst friends, able to be themselves, encouraged to shine and be reminded of how amazing they each were so they would leave feeling a little bit taller, grown in self belief and confidence, and inspired to take action. I can’t claim that my presentation skills were that sharp, but I’d learned some time before that making others needs more important than my fears would get me through, and Maya Angelou’s quote, “It’s not what you say, but how you leave them feeling that matters…” was something I relied on, and the meetings always turned out wonderful despite my fears or unpolished presenting! The feedback from the members has been so positive and the group is thriving – even sold out on a couple of occasions! I’m feeling a lot more comfortable now – I even manage to leave the Rescue Remedy at home these days – but I couldn’t have done it on my own. The Global Winning Women team is amazing support and the members are all incredible women; I’ve had lots of help from presentation coaches, hypnotherapy geniuses, mentors who helped me believe in myself, partners who’ve given me other opportunities to speak about my passion – transformational branding – and clients whose transformations have made all the hard work worth while. So I encourage you to go for what matters to you and find the people you need to help you get there. Through working closely with others I’ve been able to create a networking group that I adore, I got over my technology fears to do videos and webinars, created and delivered twice my online programme, Brand from the Heart and facilitated a powerful live event (Click here to find out about the next one in January); I worked on my ‘money mastery’ so I’m no longer hustling (in an energy of neediness) to get clients to work with me, and I’ve increased my turnover significantly. I have attracted wonderful clients, partners and friends, I got invited to be Keynote Speaker at The Extraordinary Lady Speaks Conference and won an award for ’touching lives and making the world a better place’; and I’m honoured to have been nominated as ‘Women’s Role Model’ at the Women Inspiring Women National Awards, with votes and lovely messages from so many amazing women. So what do YOU want for yourself in 2015? 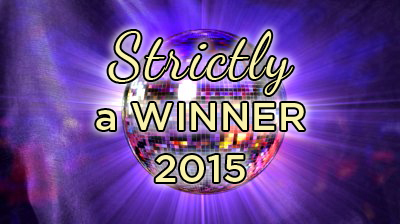 What partners do you need to dance with to be a WINNER in your own life next year? Who do you need to be to attract the right people and opportunities to you? Who can help you step up and onto the scary dance floor, dream big and let go of the limiting beliefs that are holding you back from making the difference you know you’re here to make? What new routines do you want to take on to help you grow and find success? Facing fears grows your confidence, expands your self belief and gives you the freedom to dream even bigger. I’ve already got some AUDACIOUS, JUICY goals for next year and I’ll keep you posted as the journey unfolds. But I really want you to know, if I can step through the fears and make big shifts so can you. There really is nothing stopping you but YOU! So get the support you need and……KEEP DANCING!! !